Vacuum Coffee Makers – the most elegant, visual way to make a perfect cup of coffee. A rather nice vacuum coffee maker set up in a restaurant. When one looks at one of the modern vacuum coffee makers, like the very elegant Bodum Santos, it is tempting to think that vacuum coffee making is a new technology. Not so. Vacuum coffee makers were being used back in the eighteenth hundreds. And during the nineteen hundreds the process was being refined by companies like Silex and Sunbeam. 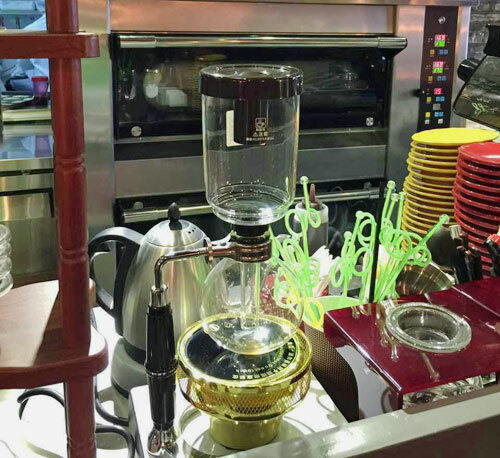 But of one thing there is no doubt – a glass vacuum coffee maker, well designed, is elegant not only in its appearance, but also in how it works. Does a vacuum coffee maker make better coffee? It certainly makes a very smooth cup of coffee, with very little sediment. And because of the simple laws of physics, it’s very hard to make a mistake while brewing this way. So you can be sure of a near perfect brew every time. That said, the quality of the brew isn’t the only reason you might want to buy one of these beautiful devices. 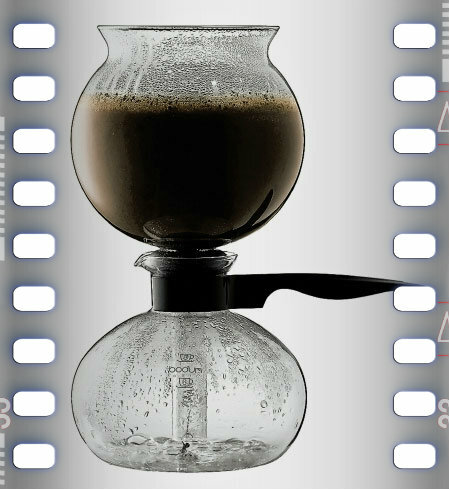 Unlike chunky plastic drip brewers with all their buttons, LCD displays and memory chips, a vacuum coffee maker is just glass, with a small filter. You can buy one with a built-in heating element, or place it on your stove or over an oil burner. And when you are entertaining, a brewer like the Bodum Santos Stovetop Glass Vacuum Coffee Maker is great. No microchips. No plastic that is colored to look like metal. No gizmos or timers. Just a beautifully designed, beautifully functional device in glass. And to add to the pleasure even further, you can watch your coffee being brewed...from one glass chamber to another. So while you might want to hide your monstrosity of a plastic drip brewer on your counter...brewing coffee with a vacuum coffee maker adds a wonderful atmosphere when done over an oil burner on your breakfast table or dinner table. It’s worth having one just for the simple pleasure of seeing it in action. 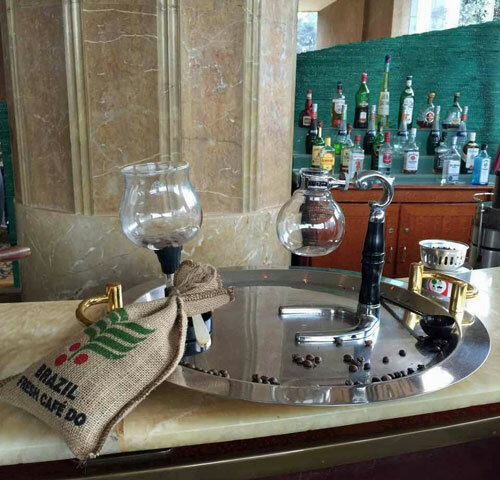 This photo of a vacuum coffee maker was sent to me by a friend who found it in a hotel bar in China, of all places. A more traditional, and simpler Bodum vacuum brewer.